You are here: Home / Events / The Midlands are Alive with the Sound of Singing! The Midlands are Alive with the Sound of Singing! 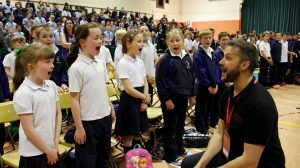 In June more than 1,500 children and young people will flock to Athlone Institute of Technology (AIT) for a three-day festival of choral singing to mark the culmination of Singfest 2017. Developed out of a groundbreaking choral residency presented by Music Generation Offaly/Westmeath (MGOW) in partnership with the Association of Irish Choirs, Singfest 2017 will play out its epic concluding weekend with two ‘Big Sings’ (Thursday 8 and Friday 9 June) and a very special Gala Concert on Saturday 10 June. Across the three days, 1,200 young singers from MGOW partner schools and 300 members of the Singfest Festival Choirs will be guided by international choral conductor Greg Beardsell and a team of expert musicians from the Irish Youth Choir and MGOW, who have been working closely with the children and young people in preparation for this momentous occasion since October last year. The Singfest festival of choral singing is funded through the Music Generation/Arts Council Partnership to give young singers a chance to train with leading professionals, develop their singing skills and have fun! For the second successive year, Singfest 2017 has seen the creation of three community-based choirs for children and young people – The Junior Choir for ages 8 – 10; The Young Voices Choir for ages 11 – 14; and the Senior Choir, a four-part choir for young people ages 14 – 19. The members of these choirs, who come from all areas of Offaly/Westmeath, from Mullingar to Birr and Edenderry to Athlone, have been working together with the professional choral conductors on a monthly basis to develop their repertoire and ensemble singing. They will present a showcase of their work at 4pm on Saturday 10 June, at a large-scale Gala Concert in AIT. Singfest’s in-school element saw pupils of MGOW’s partner schools all learning a shared repertoire and developing their choral singing skills over the last six months. This aspect of the project will culminate in two days of ‘Big Sings’, each bringing together 600 pupils for a series of workshops and group rehearsals. At the ‘Big Sing’, the singers will pack the auditorium completely, acting as both audience and choir – there won’t be a seat left in the house! As well as creating unique opportunities for budding young singers, Singfest offers a chance for local, national and international professionals to work in partnership, share learning and extend their skills in choral development under the leadership of Singfest Artistic Director, Greg Beardsell. The inspiring Singfest musician team includes professional musicians of the Irish Youth Choir and MGOW. All are experienced performers, vocal coaches, conductors and educators who have a wealth of experience in working with young singers of all ages. Also performing in the momentous Gala Concert performance will be members of the MGOW instrumental team who will provide an inspiring accompaniment.